Queensland Rail has launched an urgent inquiry to find out why Brisbane's inner-city train lines have been cut by rising floodwaters three times in three months by heavy rain since November. Sources say Queensland Rail is treating the issue extremely seriously because until recently train lines at Central Station, Fortitude Valley and Bowen Hills have not previously been cut by heavy rain. There are suggestions that the 2011 floods may have changed drainage flows, though this is not confirmed, nor substantiated. Train lines at inner-city train stations were cut on November 19 and 27 in 2014, and the past weekend. Hundreds of commuters were stranded, with dozens walking home in the rain. On November 27, a YouTube clip of floodwaters running over train tracks at Brisbane's Fortitude Valley station was viewed more than 17,000 times. Now an independent inquiry has been launched after last weekend's deluge again covered rail lines and blocked trains at all stations between Roma Street and Bowen Hills. Queensland Rail executive general manager (Network) Tim Ripper confirmed an investigation was under way to find out why train lines become covered by rainwater. "We are in the process of engaging an independent engineering consultant to work with Queensland Rail and Brisbane City Council to identify solutions," Mr Ripper said. Queensland Rail quietly began urgent checks in November 2014 after Brisbane's Central and Fortitude Valley stations were cut by rising floodwaters. The rising water came from quick run-off from neighbouring properties, Mr Ripper said. "Despite our best efforts to eliminate flooding issues on the city network, there have been three recent weather events that have caused delays to the city network due to flooding, on 19 and 27 November, 2014, and across the weekend of 21 and 22 March, 2015," he said. "Flooding was experienced on the rail network between Fortitude Valley and Central stations, due to run-off from surrounding properties." He said flooding in November 2014 affected all south-east Queensland, not only the rail network. However, Mr Ripper said the drainage system was working. "On all occasions, services were suspended in the interest of public safety, and in each case, the water has cleared quickly, due to the robust drainage system in place," he said. The rising floodwaters blocked trains for 45 minutes between Roma Street and Bowen Hills stations on Saturday and Sunday, he said. "We understand that our customers have been impacted by flooding on the network," he said. "We have undertaken significant investigations since the flooding was first experienced in November and are in the process of engaging an independent engineering consultant to work closely with Queensland Rail and the Brisbane City Council to identify solutions." Queensland Rail had a comprehensive flood mitigation plan in place for the city network, he said. - An extensive drainage system across the entire rail system. - Pumps to quickly drain water away. It is inspected twice a week as part of a routine maintenance and cleaning program. Fairfax Media understands the terms of the investigation are being finalised and a "report back" date in now being determined. "Queensland Rail is committed to addressing this issue and will consult with government on the recommendations," Mr Ripper said. The fact that our rail network all concentrates on the core section Roma St <-> Bowen Hills does little for network resilience or redundancy. The frequent network shut-downs due to issues on the core section highlights just how useful Cross River Rail will be in terms of improved resilience and redundancy. Years of transport neglect and tardiness are now seriously impacting. Will we see improvements or worsening of the transport networks in SEQ? Queensland's poor reputation is spreading. A comment from the Sunday Mail yesterday, Around the traps with Peter Cameron. Fair comment don't you think? It seems that flooding on the rail network, with consequent significant disruptions is now a routine event in the CBD. Is this due to a number of recent developments altering rain water run-off flows? In years gone past the network was much better able to withstand heavy rain falls. 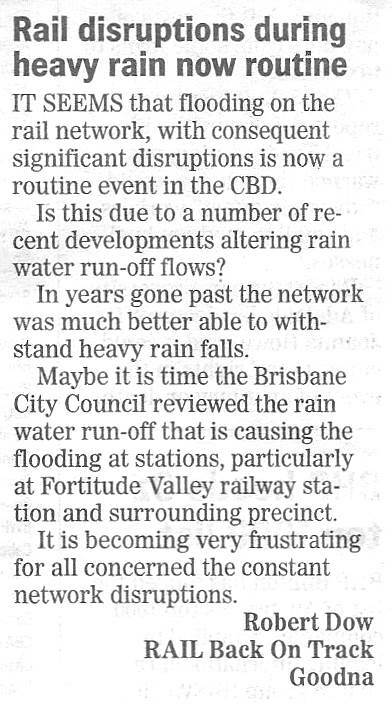 Maybe it is time the Brisbane City Council reviewed the rain water run-off that is causing the flooding at stations, particularly at Fortitude Valley railway station and surrounding precinct. It is becoming very frustrating for all concerned the constant network disruptions. 3. Fortitude Valley station makes a great swimming pool! It was the correct thing to do -- the inquiry may need the experience of a hydrology expert. Nice to know that RailBOT's suggestions get heard in high places. An independent investigation is underway to determine why a major inner-Brisbane rail station has been flooded by rain three times since November. Train lines at Fortitude Valley Station were cut twice in November 2014 and most recently this past weekend due to heavy rain. This morning, Queensland Rail (QR) confirmed they had launched an independent investigation to determine what caused the station to flood this season. "We do have good maintenance programs around our drainage, making sure that our drains are all clear. It's really important for the rail network to have clear drains so we can continue to run," QR Rail corporate and customer relations general manager Rebecca Masci said. "It's really important to make sure tracks are well maintained in terms of the rock underneath the rail itself so water can drain away quickly. "All those things we know that are solid, so our question is why does Fortitude Valley station seem to have flooded three times in one season when it hasn't in the past? "That's what we're getting independent engineering consultants to come in and have a look at to and just to determine what the cause is, what's changed this season in compared to previous seasons." Ms Masci said the first two events last year were "significant events and they had huge impact across city". "It wasn't just our network. Everyone was impacted by the amount of rain and types of storms that occurred," she said. "We recognise that in terms of our customers they are impacted at end of the day, we recognise they're frustrated. "We're not comfortable with that ... we want to see more detail around it ... that's why we're bringing in someone independent to have another look, to have fresh eyes on the problem." Brisbane-based hydrologist Tony Weber from WBM Oceanics said the first thing he would look at if he were involved would be any new drainage connections. "There has been fairly significant developments in that area and that'd be one of the things I'd look at first," he said. "Also, looking at the size of events and if there was anything unusual about them in the valley area because that can be quite typical." Mr Weber, who previously worked for Brisbane City Council, said, to his recollection, some of the drainage in the area was "extremely old". "Over 100 years old in some places," he said. "It could be deterioration of that drainage, might have been a collapse or there may have been water pushed around in there that caused a blockage in a particular area or there may have been a new connection. "Each one of those things could've lead to flash flooding that was seen at the station itself." Stone drains 140 years old are being investigated as council joins a Queensland Rail investigation into recent flooding of Brisbane's inner-city rail lines. Since November, rain has begun to block train lines at Bowen Hills, Fortitude Valley and Central stations, causing major cancellations of services. Queensland Rail announced on Tuesday it had launched an independent investigation into why flooding has begun to occur at these inner-city train stations. On Tuesday QR wrote to Brisbane City Council asking for help with the inquiry. "Council is working with Queensland Rail to review stormwater drainage and hydrology plans for the Fortitude Valley catchment area," a council spokesman said. "Some of the inner-city drains were first constructed in the 1870s." Overall, Brisbane has an extensive drainage network, with more than 2640 kilometres of enclosed stormwater drains. Lobby group Rail Back on Track said it believed the floodwaters that have begun to block lines could be coming from a blocked old drain. Spokesman Robert Dow said the organisation's network of drivers and QR staff believed old drains - or the increase in developments in Fortitude Valley - were having an impact. "What we think is that the flows around the general precinct have been altered," Mr Dow said. "They may have been altered through development, that is a possibility. "I've also seen something that some of the old drains could be blocked. "Not necessarily on railway property, but adjacent which is adjusting the rainfall flow." Mr Dow said he was glad some of Brisbane's old drains were being investigated. "Some of the drains around that area are around 100 years old," he said. "So it is possible that there has been some blockage in some of those old drains that hasn't been picked up, which is re-directing flows into new areas, novel areas like the Fortitude Valley Station 'swimming pool'." This financial year council is investing $59 million to fund 70 vital stormwater drainage projects. An extra $20 million has been allocated to repair and maintain the network. Mr Dow said rail drivers were pleased the issue was being investigated, because it was affecting the central core of Brisbane's rail network when rain was not overwhelming. He said while the November hail storm was significant, train drivers had reported earlier instances. "If you have a problem in that core section, you have a problem with the whole network and it can really be disruptive to many thousands of people, particularly at peak hour," he said. 4KQ RadioBreakfast with Laurel Gary & Mark followed up with an interview. One of Brisbane busiest train stations - Fortitude Valley - needs millions of dollars of work to prevent a repeat of flooding that stopped all trains in both 2014 and 2015. A six month Queensland Rail investigation has blamed drainage pipes under the station that are too small, rail tracks that are six metres lower than the rest of Fortitude Valley and one drainage pipe that was 80 per cent blocked. If urban rail was a sports stadium - there'd be a station on every corner! Keep it LOUD for Pro-Rail! Wow, what an absolute damning report! This is going to be interesting to see how this pans out! The best reports are the ones that lay out the naked facts. Unfortunately, politicians hate this!! "The installation of the twin circular culverts and numerous gullies would still require the removal of all four tracks (including rail, sleepers and ballast) for approximately 40 metres and result in considerable disruption to the rail traffic," the report says. There is probably good time in April to make a whole heap of disruptions. Trains could be terminated at Roma Street for Southern services, pax could catch buses to the CBD on the busway or walk. Northern services are a bit trickier. Northern services could also be terminated at Roma Street, but I guess that would require some services to be culled. This too could be done by using pre-1978 technique of terminating Beenleigh trains at South Brisbane station to free up platform space. With 50% air at Cultural Centre in peak hour, there should be space, or some people could walk over the Victoria Bridge into the CBD. The Yeerongpilly line could be used to divert Beenleigh / GC trains into Roma St via the Ipswich line also. The rest could be bustituted. Sans Cleveland line (which could be cut short at South Brisbane). My understanding is that approaching from Exhibition and into Roma Street / Central was the usual way to get into Brisbane before FV station was constructed. That would be in the late 1800s. Yes, the Exhibition line was the original Shorncliffe line when Roma Street was the terminus, built even before Central station! The southern/eastern services could probably still run into Roma Street, just open up platforms 2 and 3 to supplement platforms 4 and 5-7. Overall, this is a very much warts and all report, blunt and to the point, and both BCC and QR have fallen short of doing what they are meant to do. Regardless of what they do, Fortitude Valley will be almost a no go zone for weeks, if not months! I think the word that sums it up is - ouch! My 'sources' were spot on hey? Took long enough to say it was mainly a blocked pipe. I hate to point fingers, but two of those three things have always been there. The line has always been below ground, and the drains have always been designed the way they are (which was probably best practice when they were built, but no longer is). Two of these things have always been there, but the station only started flooding recently. So, reading between the lines, QR haven't been cleaning their drains. According to the diagram attached to the article, some of the internal drains in the station are fully blocked, and (more importantly) of the three connection points where the station drainage network discharges to council infrastructure, one is 80% blocked, and the other two are 50% blocked. No doubt about it, FV station flooded because QR didn't maintain it. It all boils down to whether you are a 'rip the Bandaid off quickly' person or a 'rip the Bandaid off slowly' person. The Bandaid has to come off (i.e. the drainage has to be fixed). it is just which solution to pick. For many reasons the solution is the one that best serves the people of Queensland in the long term. We don't want to be here again in future through a half-hearted job. Let's hope good engineering wins out over bean-counting, which results in the cheapest option, but not necessarily the best. With all the development going on the The Valley, there is a lot more roof space and concrete feeding water into drains that may have been appropriate in times gone by, but not now. Just because the drainage problem is on QR land doesn't mean that the problem is solely that of QR, even though they didn't do proper maintenance. Maybe that is because the bean counters cut back on the maintenance cycles. We are committed to providing a safe and reliable service and are currently considering recommendations made by an independent engineering firm into flooding which occurred at Fortitude Valley station during last year’s wet season. It is too early to comment on any improvement works which may take place in the future, however our view is that these will take place with little impact to our valued customers. The report specifically notes that work could be undertaken between 12am and 4am and as always we would work with TransLink to provide alternative transport during this time. The investigation found that high intensity rainfall, consistent with a one in ten year weather event, contributed to flooding at Fortitude Valley station during last year’s wet season. It also found that the chance of flooding could be reduced by increasing the size of drainage pipes under the Queensland Rail network and Fortitude Valley precinct; however only a joint approach with Brisbane City Council will have any significant impact. We are currently working with Council to consider the report’s recommendations and agree a joint approach to resolve this issue. We will maintain our robust maintenance regime and have established a rapid response team who will be onsite at Fortitude Valley station when any significant weather event is predicted. The report should be made public. I don't think it is a 1 in 10 year event, didn't it happen three times in one month??? QR are looking to resolve the problem jointly with BCC. That equals blame game, bunfight and haggling over who pays what and whose drain feeds into who else's drain. It is no use having a ginormous new drain on QR land feeding into a narrow drain on council's land. That just transfers the catastrophe somewhere else. As to 1-in-10 year events, the minimal design standard for these things usually is to plan for a 1-in-20 year event, but 1-in-50 is considered prudent. On long term averages it is a 1 in 10 likelihood of occurring. The next 7 events should be less (but could be as severe as 1 in 9). "Years" is an incorrect method of measurement. They could close 2 tracks at a time between Bowen Hills and Central and have trains run via the Ekka line. @ Roma Street you have busses every 30 seconds @ The Busway to King George Square where people can change to 60 199 196 etc to the valley. Or people coming in from the South can change @ Southbank to the Busway ? Capacity on all lines would be severely reduced in this scenario. All trains would have to turnback at Roma Street, limiting capacity. Maximum capacity from the north would be reduced by at least 16tphpd in the am peak due to running on 2 tracks instead of 4, and Ferny Grove Line services may not be able to run at all into Brisbane (depending on whether they can be turned back at Bowen Hills). Unless there is a major Dec/Jan closure, then it'll be night and weekend work. You could do it over the Easter School Break or Winter Break when there is less patronage. If only they had a new rail line that can decentralize the network and help with diverting some trains away from the core and serve new parts of the city at the same time while it's being fixed....oh wait! Queensland Rail will not close Fortitude Valley train station to speed up $19 million of repairs to prevent heavy rains flooding the train lines as it has since November 2014, QR's corporate affairs manager Rebecca Masci said. The flooding has the potential to cause 45-minute delays to services between Central and Fortitude Valley until repairs are made, flood modelling reported by Fairfax Media on Tuesday reveals. Fortitude Valley rail station has also been subject to "nuisance flooding" for 40 years, a report into flooding shows. The repairs are needed to replace narrow drainpipes under the train station with new two metre wide drains. This could stop torrential rain blocking the tracks, halting trains and interrupting thousands of rail commuters' journeys. If repairs are not completed, further flooding will happen if it rains heavily for 40 minutes, the report also says. "It is likely that relatively short duration rain (less than 40 minutes) and high intensity events will result in flooding," the report also says. "We will not be closing the station during peak periods to undertake this work," Ms Masci said. Instead, Queensland Rail is likely to do the work at night after late trains finish and before the earliest trains start. This work could take three years. However no decision has yet been made. Ms Masci would not answer why the work needed to take three years. "It is too early to comment on any improvement works which may take place in the future," Ms Masci said. "We are currently considering the recommendations made in the report as a priority, alongside Brisbane City Council," she said. "In principle, we support the recommendations made, however more thorough consideration and investigation needs to be undertaken before any plans are able to be confirmed." Rail lines at Fortitude Valley rail station were covered by 30 centimetres of rain in November 2014 and again in March 2015. An independent study into the problem reported by Fairfax Media on Tuesday showed flooding was caused because Fortitude Valley train station is six metres lower that the surrounding landscape, drainage pipes are too small and one major drainage pipe was blocked until revealed by consultants, Jacobs. Water also backed up in a QR 900mm drainage pipe. Four options to repair Fortitude Valley train station were recommended in the report which was finalised on October 6, 2015. The options outlined in this report by Fairfax Media show work could cause major traffic problems in Fortitude Valley. The report makes clear Fortitude Valley rail station has been subject to "nuisance flooding" for 40 years. "Historically, the station has been subject to nuisance flooding since approximately 1976, the report says. This "nuisance flooding" has been getting progressively worse, the report notes. "It has been noted that during a number of recent heavy rainfall events - 19 November, 27 November 2014 and 21 March 2015 - the severity of the nuisance flooding has increased. "These flood events have the capacity to stop rail operations between Central Station and Bowen Hills for approximately 45 minutes until the existing network manages to drain the ponded water, significantly impacting QR's key performance indicator of on-time running performance." Queensland Rail's general manager Tim Ripper said in mid-December 2015 repair work could take three years. Mr Ripper said the recommendations made in the report were long-term solutions and would take at least three years to be implemented. "In the meantime, we have established a rapid response team who will be on site at Fortitude Valley station when any significant weather event is predicted," he said. It is unclear what QR's rapid response team would do to eliminate flooding problems caused largely by gravity, heavy rain running downhill, clearly inadequate drainage, and blocked drains. Neither Queensland Rail nor Brisbane City Council would say when repair work would start. Hear no evil, see no evil. In 9 years of commuting in Brisvegas, BrizCommuter only aware of this being an issue from Nov '14. There have been plenty of major storms and rain events in those 9 years. Sounds like "QR's failure to clear blocked drains" has been getting progressively worse. Drains are usually self-cleaning due to gravity and large flows of water. BrizCommuter would expect that the debris may be rocks (? ballast), litter, or silt. Maybe QR's drains are not on a sufficient slope to allow self cleaning? My concern is that they try this piece by piece over 3 years or so, and during that time a rain event happens and it floods the station even more. I think FV station can be taken offline safely and with minimum disruption. Terminate services at South Brisbane and Roma Street. It will be a headache, but only for a month or so. 1 month of headaches for a potential of a 45 minute delay once in ten rainfall events? Seems a bit extreme. Surely clearing the drains alone will have made a massive improvement. I think the slow approach is ok, if this where a monthly occurrence it is a different matter. I wonder if microtunneling the new drains was considered. The way things are going, I think it is prudent to do the work - heavy rainfall is only going to get worse. Unfortunately we're halfway through the best period to do month-long closures (Christmas & New Year leading into January). Dare I say it, this is probably the best option, rather than a year of night closures. The possibility of flooding during works also should be considered, if that hasn't already been done. Perhaps in the interim, something can be done to at least unblock the drains and reduce the chance of blockages? Is it really that hard to run frequent, reliable public transport? Surely they could shut it down over the X-mas period at the end of this year/early next year. People go on holiday. Part of the work could also be done over Easter holidays. etc. Won't somebody please think of the Christmas drunks. IIRC towards the end of this year the inner city overheads are getting replaced so they might be able to bundle something into those closures considering Bowen Hills-Roma Street will be closed. Rail commuters using Brisbane's Fortitude Valley train station should pray it does not rain heavily this summer because no work is underway to stop repeated flash flooding over the Valley's train tracks. This is despite a consultant's report recommending remedial work start in September 2016 to stop a repeat of flash flooding over rail tracks causing delays to hundreds of trains for thousands of hours in November 2014 and May 2015 at Fortitude Valley, Central and Bowen Hill stations. The Opposition immediately questioned if some of the $67 million announced for the Central Station upgrade on Monday could be "better spent". Both Queensland Rail and Brisbane City Council have baulked at the recommendation from Jacobs to do the work at night over between 30 and 45 weeks; or by completely closing the Fortitude Valley train station for four weeks from September 2016. The work would create major problems in Fortitude Valley's business areas. Consultants Jacobs in January 2016 recommended replacing water pipes around the Valley train station from September 2016 ahead of the storm season and be completed over three years. It estimated the cost of installing bigger pipes was between $17.1 million and $19.2 million. The report blamed drainage pipes under the station that were too small, rail tracks that were six metres lower than the rest of Fortitude Valley and one drainage pipe that was 80 per cent blocked for flash flooding over rail tracks at Fortitude Valley. The blocked pipe was cleared quickly, but no further work has been done although electronic sensors have been installed to give Queensland Rail staff 20 minutes notice before water flows over the Valley's rail tracks. No remedial work is planned. Queensland Rail defended taking no action as the 2016-17 storm season approache and said it was waiting on an alternative plan from Brisbane City Council. "The council is working on a revised plan which has the potential to further improve flood immunity," a spokeswoman said. "Queensland Rail is now seeking further information about the relevant costs; timeframe and impact associated with the revised plan and is meeting with Council later this month to progress this." Brisbane City Council is completing its own hydraulic engineering study into the problem to minimise "inconvenience to commuters." "Council and Queensland Rail have agreed to seek other options for resolving flooding issues at the Fortitude Valley Station, which would minimise line closures and therefore inconvenience to commuters," their spokeswoman said. "A hydraulic engineering investigation is being conducted to identify alternative options." The lack of progress into another emerging major rail problem in Brisbane angered Opposition transport spokesman Andrew Powell. Mr Powell questioned if any of the $67 million spent on upgrading Central Station could have been spent halting flash flooding. Mr Powell called on the Premier to reveal what portion of the $67 million Central station facelift would address flooding issues. While platforms will be raised to improve disability access, there was no mention of tackling flash flooding. "Will any of the money go to alleviating the flood events there," Mr Powell said. "And if not, why not?" he said. 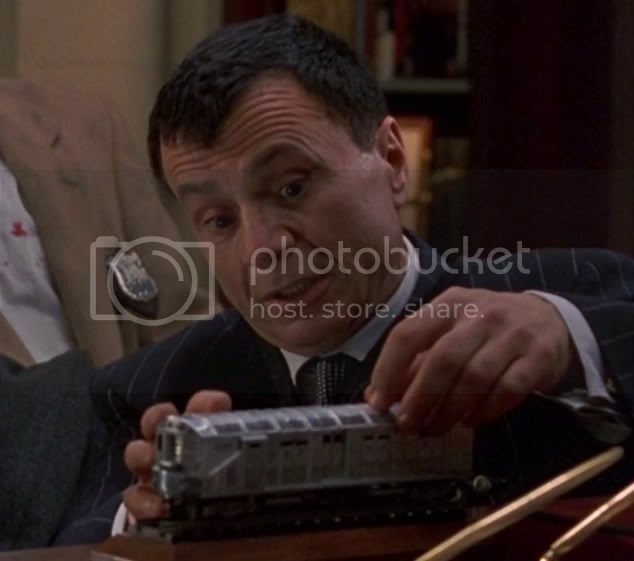 "While rejuvenating the station is one thing, it's another entirely if trains remain unable to pass with water over the tracks," he said. He said delays to repairs at Brisbane's flood-prone inner-city stations were another example of the Palaszczuk Government "dragging the chain" on vital infrastructure. 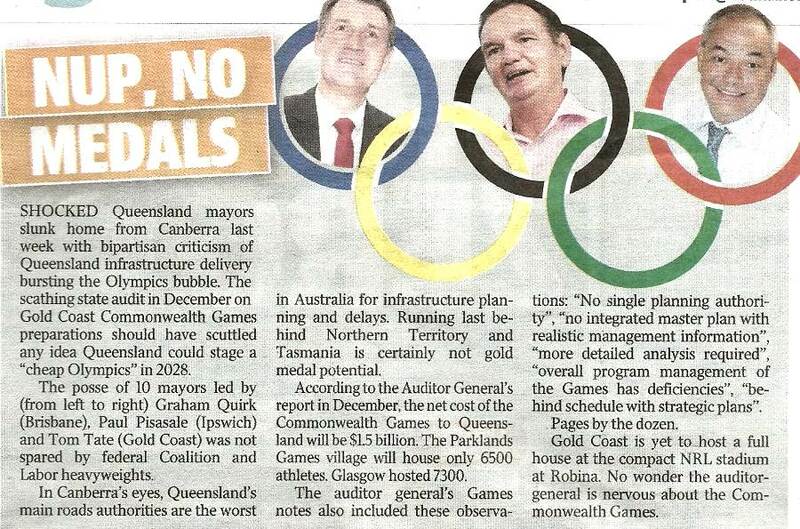 "Once again, this do-nothing Labor government is more intent on fighting itself than doing the hard yards and providing the investment that will get Queensland moving," he said. Transport Minister Stirling Hinchliffe did not say if he was satisfied with the delays to replace the pipes around Fortitude Valley before the storm season. He said it was a complex issue. "Queensland Rail is considering the recommendations alongside Brisbane City Council, to improve flood immunity at Fortitude Valley station," he said. "This is a complex, long-term project and expected to take at least three years to implement."